The Pokémon Company offered players a chance to mix things up last weekend with an online competition where only shrimp-sized monsters could strut their stuff. The Tiny Tournament let players use almost any Pokémon in the ever-growing National Pokédex, as long as they were under one meter (3’03”) in height. That means Pokémon such as the legendary guardians of Alola, Arcanine or Garchomp—otherwise stalwarts of this season—are off limits. With those rules in place, trainers were more likely to field Pokémon that aren’t fully evolved, or used a smattering of tiny but fully-evolved Pokémon that pack a punch. The grass and steel type Kartana (1’), which hits like a ton of bricks despite having an easily exploitable fire weakness, was as popular in the Tiny Tournament—but that makes sense, because Kartana is also popular in the official competitive format. And speaking of fire, Chandelure (3’03”) also seemed to be a fairly common sight thanks to its sky-high special attack stat. Finally, Excadrill (2’04”) was Tiny Tournament’s preeminent ground type, with the added bonus of powerful steel type attacks. There was plenty of creativity during this tournament, too. Long-time VGC competitor Jon Hu, who streamed many of his matches during the tournament, used Ninjask as his team’s centerpiece. The bug and flying type Pokémon is generally used for its Speed Boost ability, which raises its speed each turn, but struggles to do major damage. Hu got around that damage limitation by using Swords Dance, which greatly boosts its attack stat with each use. The real treat, though, was watching Hu use Groudium Z (with Dig as the base-move) to catch players off-guard with a Tectonic Rage. Meanwhile, well-known Eevee player, Giovanni Costa, took a break from his typical team to try something new. Excadrill and Hippopotas formed the backbone of Costa’s team, using the latter’s Sand Stream ability to speed the former up thanks to its Sand Rush ability. Rotom-Heat, meanwhile, proved to be an excellent source of damage and repositioning thanks to the speed boosting Choice Scarf item. But by far, Costa’s MVP was Honchkrow. Sucker Punch could deal priority damage to attacking opponents, Heat Wave could catch Kartana off guard, Brave Bird could deal massive damage and its Insomnia ability prevented it from falling asleep. In one match, during which the 2014 World Champion Sejun Park stopped by, Costa used all four to overcome a tricky situation against a high rated opponent. Finally, competitor Caitlin Beach ran two slightly different teams on two different cartridges. The first was more about using raw power from Pokémon such as Chandelure, Excadrill and Azumarill, while Raichu, Wartortle and Amoonguss supported them. The other was what’s known as a “Perish-Trap” team, which combines the move Perish Song with the ability Shadow Tag to deadly effect. Perish Song makes all Pokémon on the field faint in three turns, unless they switch out. Normally that would be easy to do, but when a Pokémon with the Shadow Tag ability is on the field, only an opponent’s ghost type Pokémon can switch out. So, by simply stalling for two turns and then switching your Pokémon out, you can get two easy KOs without losing any yourself. The above battle is a perfect example of how the strategy works. Azumarill has no issues with either Vaporeon or Parasect, giving it a free opportunity to set up Perish Song. Meanwhile, Beach easily switches in Gothorita on the opponent’s attempt to set up defense boosts with Vaporeon. 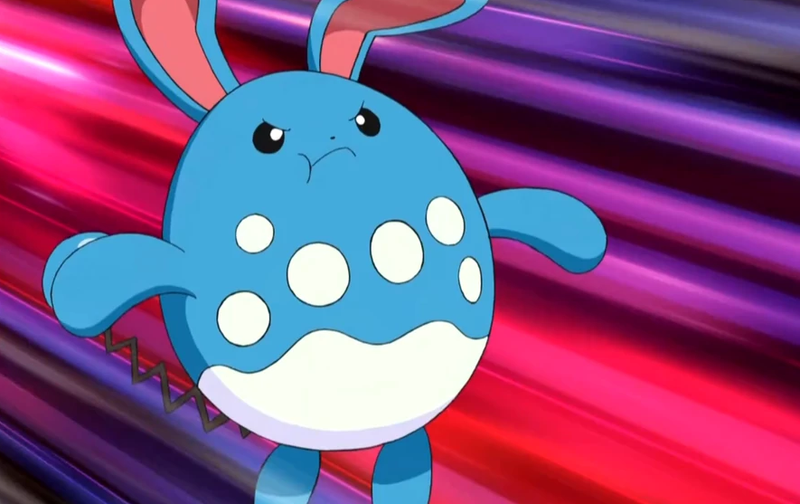 The fact that Azumarill’s Sap Sipper ability makes it immune to grass type moves, such as Spore, is just gravy. Once the trap is sprung, her opponent struggles in futility to stop it. To make matters even more impressive, she doesn’t lose a single Pokémon and only uses a single offensive move during the battle. On the whole, the Tiny Tournament pushed competitive Pokémon players to explore new options while also giving them a break from the formats they’re used to. To learn about similar tournaments with different rule-sets (which occur with semi-regularity), keep an eye on the Pokémon Global Link.